The Automatic Products 122 Snack Machine is a deeper machine than the 111. It holds a larger capacity of your favorite snacks. Comes with guaranteed vend sensors. This means no refunds or dissatisfied customers. Great for medium size locations. The Automatic Products 122 Snack Machine is a deeper machine than the 121. It holds a larger capacity of your favorite snacks. The Automatic products 122 Snack machine comes with a small footprint, 33’’ in width, but has a huge capacity to be able to hold 32 different types of selections. The Automatic products 122 Snack machine works well in small to medium size locations and makes for happy customers. 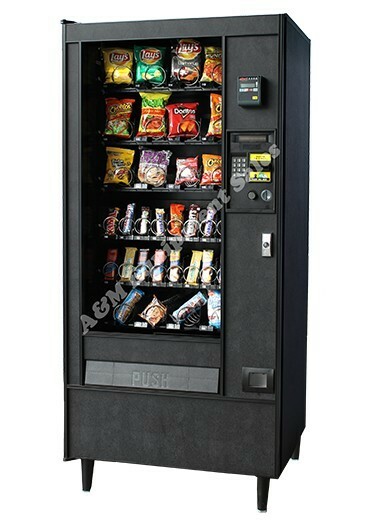 Automatic Products 121 Snack Machine is a late-model machine with the newest vending electronics “MDB” The Automatic Products 121 Snack Machine has guaranteed delivery which means your items will never get stuck on the shelves which leads to customer satisfaction. The machine can accept a credit card reader and any other new items such vend screens that tell you the calorie count of each item in the machine. It has a very sleek appearance and even has a braille key pad for blind customers. You can’t go wrong purchasing this machine. It also comes with A&M’s thorough re manufacturing process. Comes with 32 selections of snacks in a deep cabinet and has the capacity to service medium to large locations. Fits easily through a 36″ door opening. Has Golden Eye guaranteed delivery system Customer always act their item. No unsatisfied customers. Comes with energy efficient LED Lighting. Great for smaller locations: laundromats, beauty shops, but large enough for medium size locations. Comes with a redesigned keypad which is based on the telephone keypad and is in braille. Optional: New Credit Card reader with a one year warranty can be installed for $299.00.